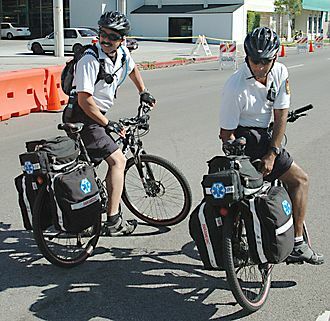 Paramedics on bicycles in Los Angeles. Kenneth W. Kizer, M.D., is an expert on the expanding potential of community paramedicine. As a former director of the California Emergency Medical Services Authority, he wrote the regulations for paramedicine in the state. More recently, he has become a thought leader in population health — and an advocate for community paramedicine in value-based care. Hospitals & Health Networks recently interviewed him. “Community paramedicine is an important component of population health management and the new emerging value-based health care economy because it fills gaps in the typical health care delivery infrastructure that are especially relevant to value-based payment. To read the whole interview, please hit this link.